At Anaconda we support our local, regional and national communities through a number of initiatives and fundraising efforts with the aim to inspire, equip and enable the community to enjoy the outdoors. Team members are encouraged to participate in volunteering and fundraising activities, which customers can support through special in-store initiatives. As a 100% Australian owned and operated business we are invested in developing stronger and healthier communities and recognising the importance of these grass-roots groups and the impact of our partnerships and support. If you would like Anaconda to consider supporting your community please contact us. Anaconda has a longstanding history of sponsoring many activities which align with our strong business focus. We are excited to be launching this initiative in store which will see the collection and distribution of second- hand snow jackets to give to those in need. 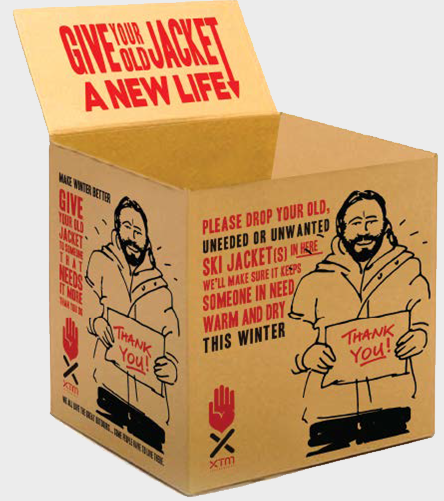 Together with Australian snow brand XTM we are calling out for locals to bring in their old and unwanted snow jackets and we will distribute them across Australia to the homeless to keep them warm this winter. There will be collection boxes at all of our Anaconda stores nationally where customers can leave their donations. Anaconda has a longstanding history of working closely with its many partners. Starting back in 1979, Big4 now has over 180 premier holiday parks dotted all across Australia. The Murdoch Childrens Research Institute undertakes research into infant, child and adolescent health. The APC encourages business to design more sustainable packaging, increase their recycling rates and reduce packaging litter. Spotlight is a signatory to the APC, supporting its vision of a business community that manufactures, uses, distributes and recovers packaging materials in a sustainable way. Read more about the Australian Packaging Covenant.